I received a virtual kick in the tush last week from a fellow blogger. She didn't think my once-a-month blog posts were sufficient. I have to agree with her. I've been busy. I know that's a lame, catch-all excuse. But, it's the honest truth. B-U-S-Y. Yeah, click that link. You'll see that I've completely lost my mind and deluded myself into thinking that someone (or maybe a couple of someones) will actually want to BUY the things my sewing machine spews out. Go ahead and 'like' my Facebook page too. Sometimes I give stuff away on there. I managed to snag an hour to make up a little personalized gift for a bridal shower I'm attending tomorrow. Print out lettering off of your computer to your desired size. 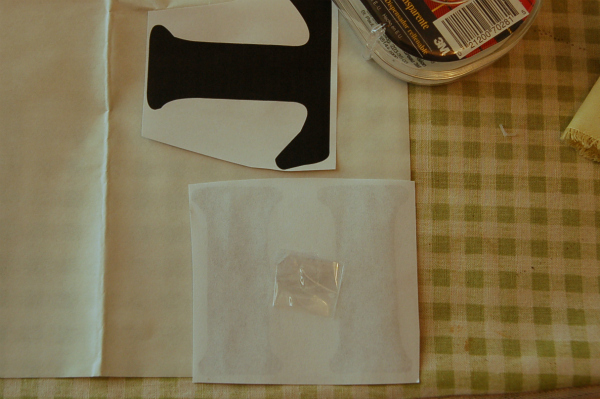 Cut around the letters (don't cut out the letters yet) and tape them to the paper side of the iron-on adhesive. If you are using letters that have a right side, like 'P' or 'K', be sure to tape them down reversed. Otherwise you'll stomp your feet and yell "Aaaahhh! I have backwards letters!" 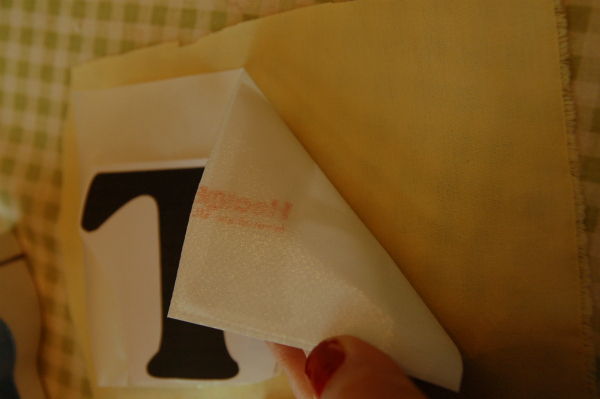 Place the adhesive, paper side up, on the wrong side of the co-ordinating cotton fabric. Iron according to package instructions. 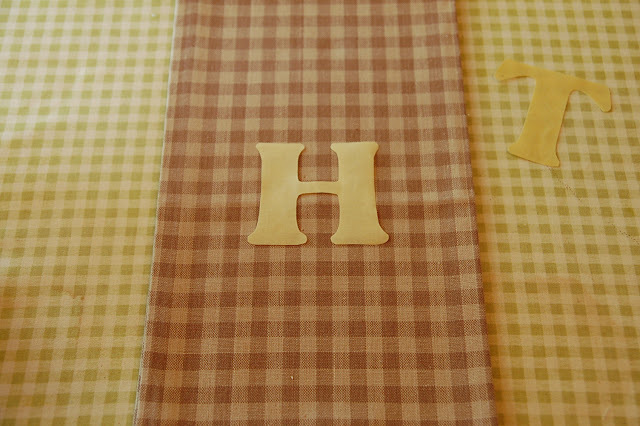 Using the fabric scissors, cut out lettering. Peel the paper backing off. Please excuse the gross, chipped nail polish. See!? No time! 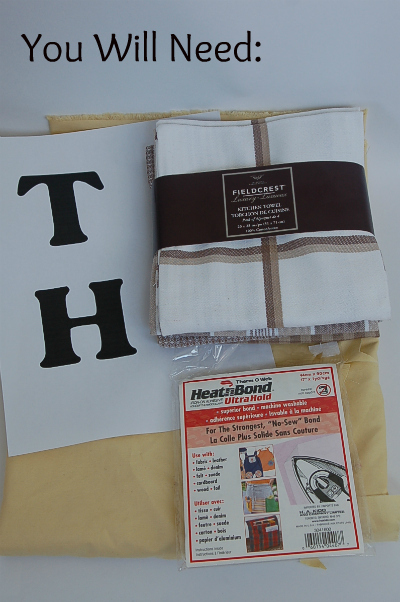 If your tea towels have come folded, be sure to unfold them and iron out any creases. Place lettering at your desired location. 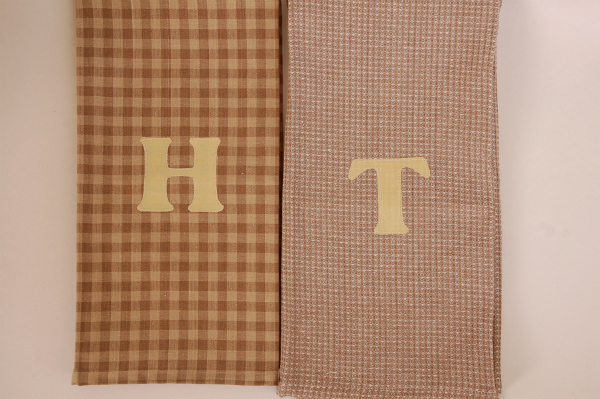 I left my tea towel folded in half (length wise) and placed the letters in the middle. Iron again according to package instructions. You can either stop here, OR add a little bit of stitching. If you don't own a sewing machine, you may want to add a neat little back stitch around the edge of the letters with an embroidery needle and thread. 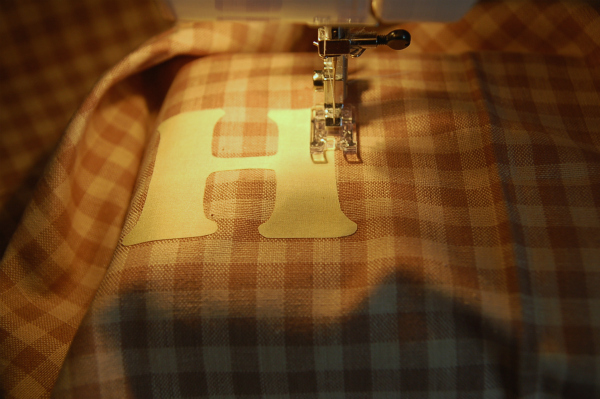 I chose to use a sewing machine, since I was short on time. 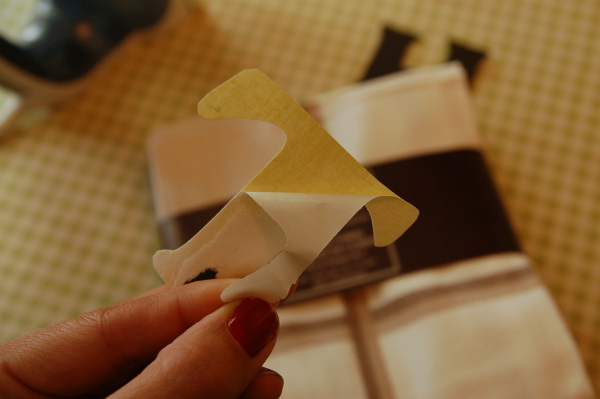 Change your presser foot to a satin stitch foot (clear plastic) and switch up your stitches to a short zig-zag. The satin stitch foot allows you to see what you're doing a little better. You'll need to stop and pivot the fabric around tight corners. 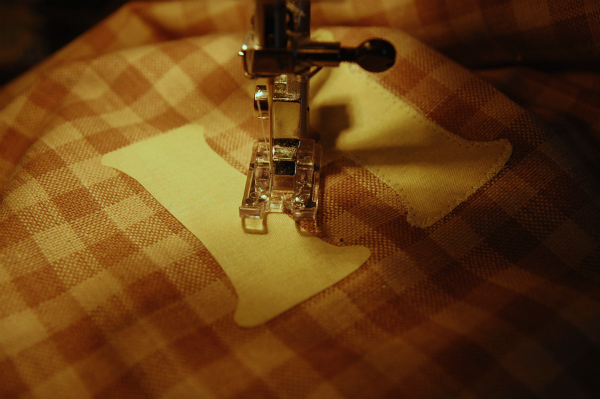 Be sure the needle is in the fabric before lifting the presser foot! I ended up doing a lot of manual hand-wheel turning around the 'H'. Snip threads and you're done! 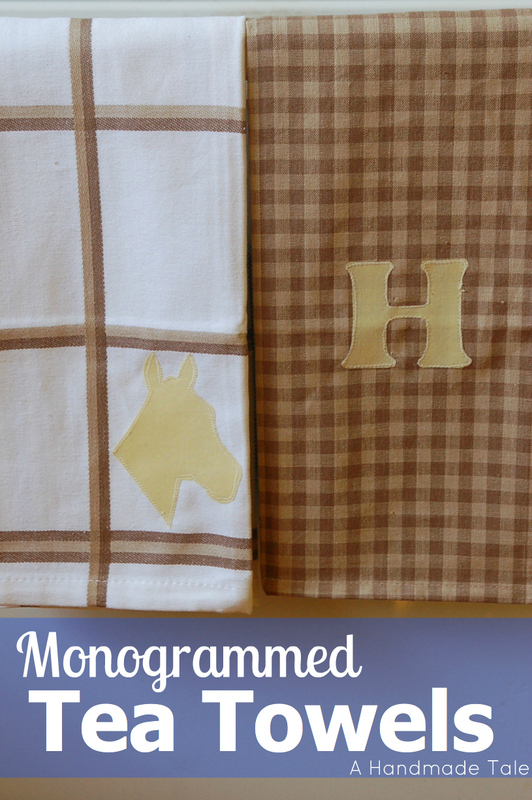 Since my tea towels came in a set of four, I thought I'd make up two animal silhouette towels as well. 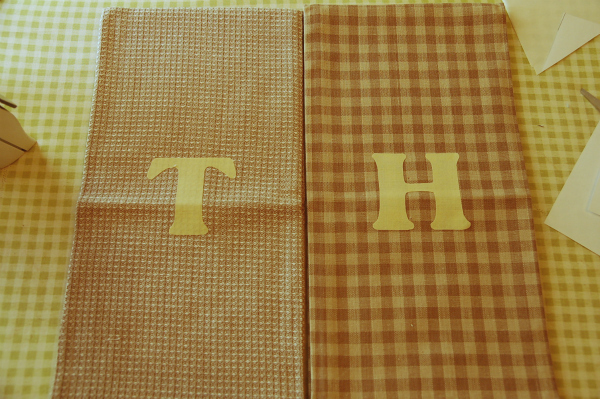 'H' is a horse riding instructor and 'T' has a beloved pit-bull cross. 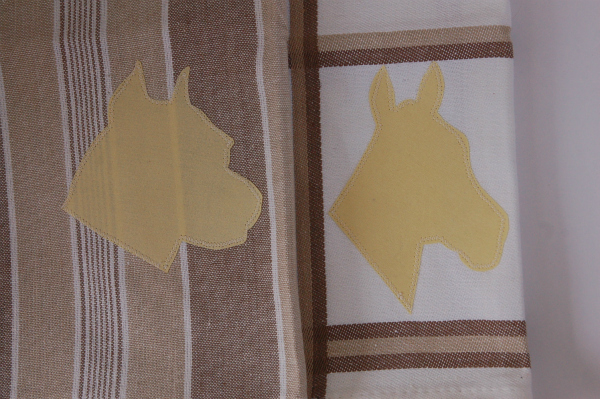 I was afraid the horse silhouette might come out looking like a donkey...but I think it looks like a horse. Sweet beans. I'm a teensy bit peeved about the lines that show through little miss pit-bull. Next time I'll use a darker fabric. 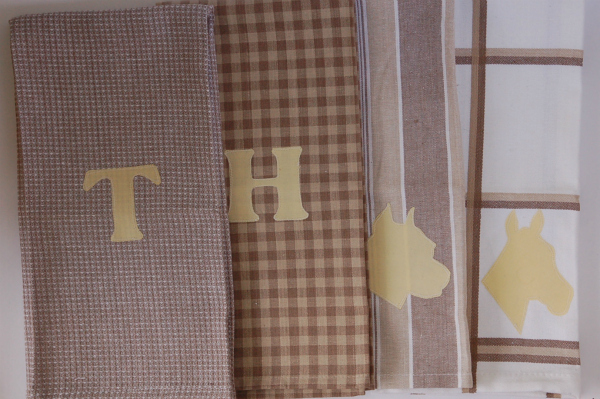 Or pattern-less towels. 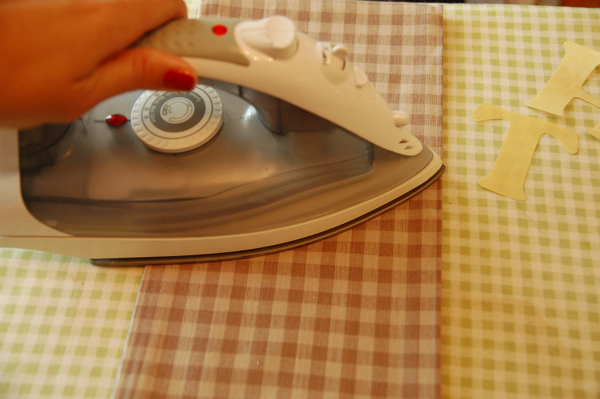 Sew and learn.